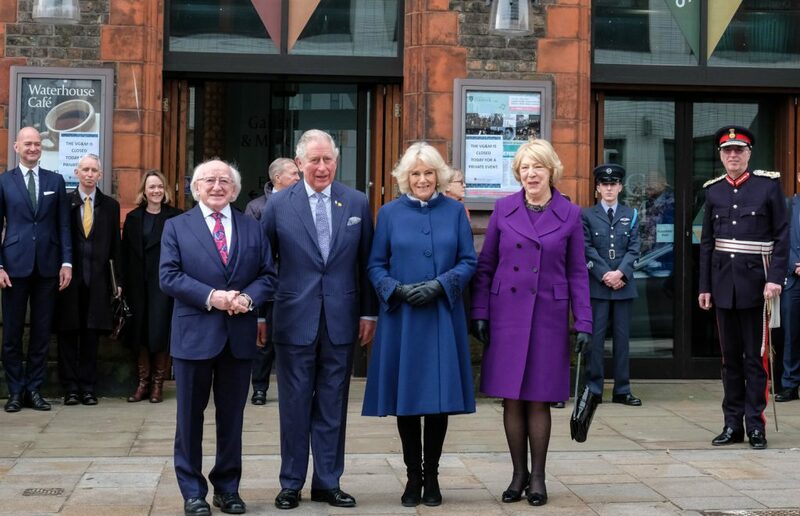 The Prince of Wales and the President of Ireland Michael D. Higgins visited the University to sign a joint patronage agreement for the Institute of Irish Studies. The visit took place on February 12 2019. The Institute of Irish Studies contributes to greater understanding between these islands. 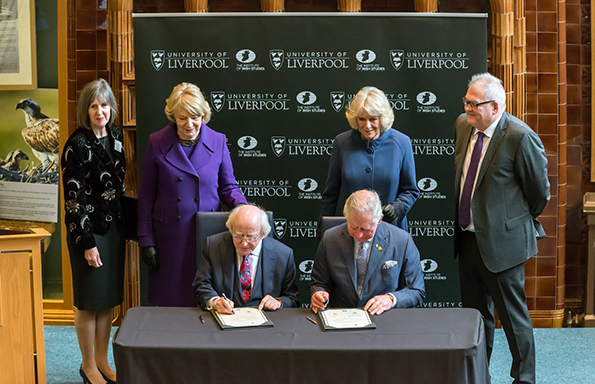 University of Liverpool Vice Chancellor, Professor Dame Janet Beer said: “We are both honoured and delighted to welcome the joint patrons of our Institute of Irish Studies, His Royal Highness, The Prince of Wales and President of Ireland Michael D. Higgins, to our campus. At the signing ceremony, which took place in the Victoria Gallery & Museum, the establishment of official Joint Patronage Lectureship, in the guests’ honour was announced. 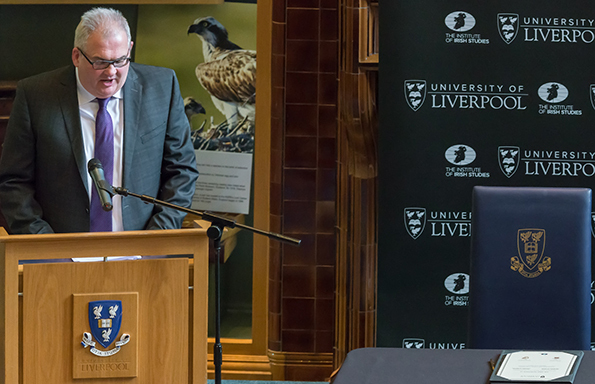 Director of the Institute of Irish Studies, Professor Peter Shirlow (below) said: “The joint patronage of His Royal Highness, The Prince of Wales and the President of Ireland Michael D. Higgins is an indication of the Institute’s role in Liverpool and further afield. At the signing ceremony, Professor Frank Shovlin, who specialises in Irish literature, read a letter written by the current focus of his research, John McGahern to one of the great names of Irish poetry, Seamus Heaney. Seamus Heaney’s daughter was in attendance. Katherine Parke, who is studying for an MA in Irish Studies, read the Paul Muldoon poem, ‘The Language Issue’ in Gaelic and English. There was also a performance of bluegrass music by Caitlin Gilligan. The patrons also met with representatives from Liverpool Irish Centre, Irish Community Care (Merseyside), Liverpool Irish Festival and Irish businesses, as well as Irish Special Needs teachers working in the region, and donors, friends and alumni of the Institute. The University of Liverpool’s Institute of Irish Studies’ foundations lie in the 1985 Anglo-Irish Agreement to encourage greater understanding and positively framed contact between the two islands. The Institute of Irish Studies was consequently established in 1988, and it is unique in terms of scholarship and outreach. Its internationally-recognised excellence in teaching, research and outreach beyond academia was recognised in 2007 by the Irish government through the creation of an endowed chair in Irish Studies. 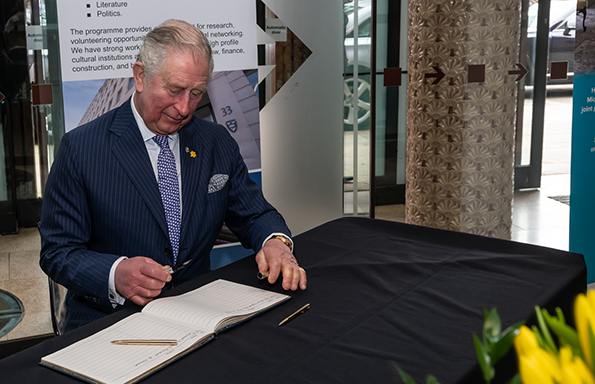 The Prince of Wales’ and President Higgins’ joint patronage of the Institute was announced in September 2017, on a shared visit to Dumfries House, the Scottish estate His Royal Highness saved for the nation, in Ayrshire.